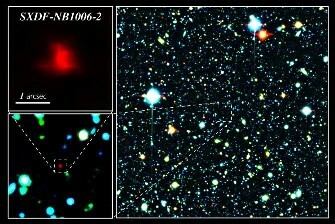 We have discovered the most distant galaxy, to 12,910 million light years from Earth. This galaxy is also the oldest of which is knowledge. The captured image now corresponds to light that was emitted by the galaxy 12,910 million years ago, the time taken to reach that light to Earth. The team of astronomers directed by Takatoshi Shibuya (Graduate University for Advanced Studies, Japan),Nobunari Kashikawa and Masanori Iye (both of the National Astronomical Observatory of Japan),Kazuaki Ota (Kyoto University),ready the finding by analyzing images obtained by them through Subaru Observatory, negotiated by the National Astronomical Observatory of Japan, and the WM Keck Observatory, made by several institutions. Both observatories are located atop Mauna Kea in Hawaii. In addition to locating the most distant galaxy, the study authors have verified that the proportion of neutral hydrogen in the early universe, when he was just 750 million years old, was greater than it is today. These findings will help to know a little better the early universe during the “Cosmic Dawn” when it first appeared in the light of stars and celestial structures. The study authors have concluded that about 80 percent of hydrogen in the early universe, 12,910 million years ago, with a redshift of 7.2, was neutral. It is believed that our universe began 13,700 million years ago in the Big Bang. The extreme temperature and density with the formation of the universe decreased rapidly as the volume of the universe increased. The cosmic hot plasma composed mainly of protons and electrons recombined to form neutral hydrogen atoms before 380,000 years elapsed since the Big Bang, that was the beginning of the “dark ages” cosmic. Thereafter, the gas continued to cool and density fluctuated. Approximately 200 to 500 million years after the Big Bang, the dense parts of the clouds of neutral hydrogen are compressed under its own gravity, and formed the first stars and galaxies. The radiation from this first generation of stars began to heat and hydrogen reionize in nearby space. With the birth of stars in many parts of the universe, it is completely finished reionization. In this era of cosmic reionization is also known as the cosmic dawn, largely because when the first stars began to shine.